40% Driver side, 60% Passenger, adjustable see thru headrests. Headrests look like a wide upside down U. Fits: Chevy/GMC Regular, Extended, and Crew Cab. Complete set includes: 2 armrest covers and console lid cover. 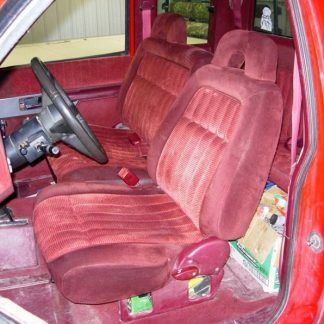 Equal sized bucket seats, integral/non-adjustable headrests, one armrest on the inside of each seat, hard plastic no passenger center console. 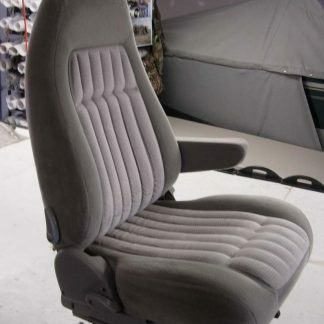 Seat cover is two piece Top and Bottom. 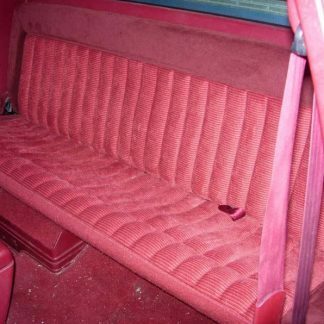 Solid Bench Seat, seat bottom folds up, no headrests. Fits: Chevy GMC Extended Cab Rear Bench.